BlueAnt Supertooth 3 & Selecting multiple contacts on Windows Mobile 6 - Arghhhh! 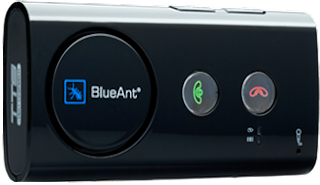 I purchased a BlueAnt Supertooth 3 bluetooth handsfree kit yesterday and spent several hours trying to find an easy way to get the Contacts list from my Okta Touch (aka HTC Touch) which runs Windows Mobile 6 Professional and failed. The BlueAnt Supertooth 3 is a nice device and pairing it with the phone was super easy (I was up and running in about a minute! ), but getting the contacts across was a challenge with Windows Mobile 6 since there is no option to select multiple contacts to Beam (send via Bluetooth) across. The benefit of having the contacts on the device is that when there is an incoming call, the callers name will be announced. I tried a variety of methods, including trying a piece of software that claimed to enable selection of multiple listings. Well, to be fair it did allow selection of multiple listings, but trying to do anything with them as a group failed. I then tried sending the contacts directly from my PC via Bluetooth but for whatever reason had no joy that way either. In the end I resorted to copying the contacts across one-by-one, and even though this was annoying there weren't all that many contacts that I needed across and it probably took me less than 30 mins. Why bother? If your device has Microsoft Voice Command (most new ones do) then you can set the option to announce incoming calls - and it will do it nicely over Bluetooth as well. Will check out Microsoft Voice Command. Thanks for the pointer. How did you get on Simon? Did you get your phone to announce incoming calls? I have a new xperia and just installed MS voice command. It says it should announce incoming calls but unfortunately it doesn't seem to work. I can't use it via the blueant at all, which was really why I got it. Any tips? I found that my Okta did not have MS voice command installed, so decided to just stick with manually loading phone numbers. I decided this was "good enough" for me for now, and for these callers they therefore do get announced. If "can't use it via the blueant at all" refers to using the xperia with the Blueant, all I can suggest is doublechecking bluetooth is indeed enabled on your phone. There may also be something you need to enable to work with a headset or speakerphone. You could also try contacting blueant directly for advice. Sorry, I can't help any more. I've been searching for over a year for a Windows Mobile phone that would really work with Microsoft Voice Command and announce the caller's name through a bluetooth headset. I've yet to find any current vintage phone that really does it. And I just learned that the new HTC Touch Pro 2 phones won't do it either because their Broadcom bluetooth stack is incompatible with Microsoft Voice Command. Thanks for the update Robert. I have in fact since upgraded to a Nokia E71 and this synchronises nicely and works great with the BlueAnt Superttoth 3.